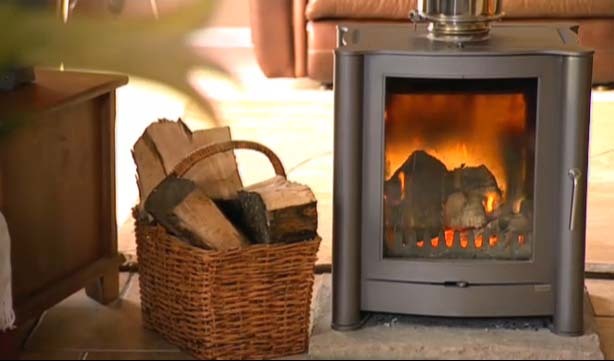 With more people choosing woodburning stoves and fires to heat their homes, sourcing green wood is becoming increasingly popular because it is considerably cheaper to buy than dry, seasoned wood. The term “seasoned” refers to wood that has been left to dry for 2 years or more to achieve a moisture content level that is below 20%. This increases the efficacy of combustion, giving you better quality fuel and reducing your running costs. 1. After felling, green wood should be stacked and left to dry in a sheltered store. Note that green wood is heavy and will require a robust structure. 2.Timing of felling is essential; standing timber will be driest in winter. Depending on the type of wood, drying usually takes two summers or more to achieve a sufficient moisture level. 3. The ideal location for drying timber is off the ground in a sunny and airy location; cover the logs with waterproof material but don’t seal the wood as the air will need to circulate. The prevailing wind should blow through the stack, ideally and will allow moisture to move from the centre of the log to the surface. Cross cut logs should be split to less than 10cm in diameter. 4. When ready, bring your cut, split logs indoors a few days prior to throwing them on the fire. This will help further with the drying process.